Traditionally the food and beverage packaging industry was dominated by glass. Many properties of glass make it an ideal packaging material: it is odorless and chemically inert, impermeable to gasses and vapor, insulating, and transparent. Glass can be shaped and coloured, and it is reusable and recyclable. By comparison, plastic packaging such as polyethylene terephthalate (PET) can have variable permeability to light and vapors, and its reuse and recyclability are currently not comparable with glass. For example the typical shelf life of beer in glass containers is significantly longer than that of beer in PET bottles. However, the concerns of both consumers and producers of food and beverages extend beyond the material’s ability to maintain product freshness. In the modern globalized marketplace, cost and affordability play an ever-more-significant role. Since its introduction as a viable packaging material, plastics such as PET have continued to grow in popularity. PET packaging is generally much lighter than glass, reducing the cost and CO2 footprint of product transportation and improving affordability. The costs of raw materials and production processes for PET packaging manufacture are also lower than glass, on a per unit basis, giving it a further cost advantage. PET can also be combined with other plastics in packaging materials to endow it with different properties. In some instances, these blended plastics lower the overall packaging weight. Figures 1 and 2, which use data from Packaging World magazine, illustrate the influence exerted by plastic and PET packaging, specifically in the North American beverage market. Thanks to preferred use of plastic as a packaging material over glass, packaging represents 26% of the orld’s plastic output. The main niche retained by glass packaging over PET is the alcoholic beverage sector. Glass offers lower permeability to O2 and CO2 than plastic, which means alcohol can be stored longer in glass. In the soft drinks sector, this is less of an issue. With the obvious cost advantage, PET has become the dominant packaging material in that sector. Despite the apparent advantages of plastic packaging materials over traditional glass materials, there is a growing awareness of the environmental impact of using plastics. With this in mind, will the demand for plastic packaging in the future be affected by environmental concerns? It is difficult to directly compare the environmental impact of PET versus glass. Studies often fail to capture the effect of the full life cycle of a product on the environment – especially what happens to packaging at the end of its life cycle. Even when recycling meets ISO standards, studies of the environmental impacts of materials vary. These life cycle assessments often fail to account for the real life, practical issues of waste disposal and recycling – such as waste collection infrastructure and waste sorting – which leave much of the world’s plastic waste in landfill or in oceans. One source of plastic waste that finds its way into the wider environment originates from the PET packaging industry. In 2017 total global demand for PET was 21.5 million mt of which 75 to 80% was used to make PET bottles. However, around 7.3 million mt all the PET production. Currently all recycled PET comes from PET bottles. 6 million mt of this recycled material goes into other plastics streams and only 1.3 million mt goes into making new plastic bottles. A further issue is that PET is not, at least in the public’s perception, infinitely re-useable – although a debate still exists over the impact of reusing plastic bottles multiple times. There are currently numerous examples, particularly in developing regions where glass bottles are cleaned and reused, that show a reduced demand for new packaging material. One specific example is the company HCCBPL, the Indian bottling arm of Coca-Cola. The company offers a program in which reusable glass bottles can be returned to the shop in which they were purchased and sent back to the plant for re-use. A similar initiative is being carried out by Diageo in India, which is the country’s largest spirits producer. Since 2017, Diageo has been collaborating with its glass suppliers to use returnable glass bottles across a number of its most popular brands. The adoption of these initiatives on a wider scale will further demonstrate the environmental advantage of glass as a packaging material compared to plastic. A recent study by Plymouth University found that a third of the fish and shellfish consumed by humans contained plastic. In addition, researchers have found that 267 species of birds and 61% of turtles tested also had plastic in their digestive tracts. With growing awareness of these and similar impacts of the use of plastic packaging and the mismanagement of waste plastic packaging, public perceptions towards packaging are beginning to change. With it, consumer trends are also shifting. Recent surveys by the market research group Mintel found that 79% of consumers in the UK think that plastic recycling should be incentivized, suggesting that a vast majority of consumers are concerned about plastic waste. Other studies suggest a consumer preference for glass over plastic as packaging material. In a survey of European consumers, FEVE found that 85% of respondents preferred glass as a packaging material and that 73% thought it was a safer material for drink packaging. It appears as though this overwhelming shift in public perception is beginning to have an impact on the behavior of businesses and legislators. For example, the EU is planning to place a ban on plastic straws, stirrers, and cutlery with the aim of ensuring that 55% of all plastics are recycled by 2030. In the UK, all major supermarkets have agreed to eradicate all unnecessary single-use plastics by 2025, while the UK government has proposed its own plan to eliminate all avoidable plastic waste by 2042. In India, Prime Minister Modi has pledged to abolish all single-use plastics by 2022. 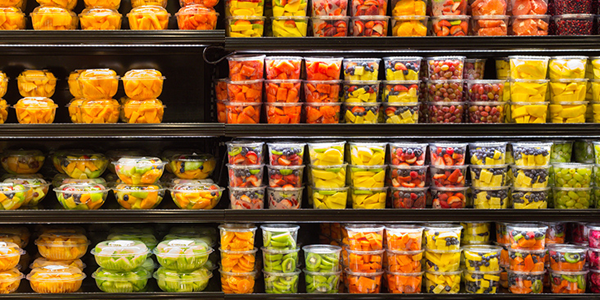 Although PET has a number of advantages as a food packaging material over glass, including cost and weight, the impact of using plastics as a packaging material on the environment is becoming a much more visible issue. The debate over what is the most appropriate food and beverage packaging material, glass, PET or other alternative materials such as aluminium is set to intensify in the coming years. As attitudes shift and the pressure intensifies on governments to address the issue of plastic waste, we could see a reversal of the trends observed the last few decades with consumers and producers opting for glass or other alternatives such as aluminium over plastics. What is global impact on virgin plastics from sustainability initiatives spanning “Reduce, Reuse, Recycle, Recover” both today and over the next decades? What are the forecast supply/demand for both a base and alternative case – with consistent assumptions across- reflecting the high risk/high recycle use? What is the potential impact on petrochemical monomer and feedstock demand resulting from plastics sustainability development? What is the current status and trends for global and regional regulatory actions affecting plastics demand and their implications?